News that a fire was devouring the municipal heart of Rogersville blazed across Canada earlier this week, catching people’s attention and stirring their empathy. Twitter feeds announced the bad news within minutes of the sparks flaring, which is where I first read about it. National newscasts and early morning papers saw fit to carry the story prominently, which is why a colleague in my Toronto office knew about it as well. She greeted me with sympathy as I arrived for work, almost as if Rogersville had been my home, or close to it, anyway. I’ve never lived there, but I suppose it was near enough to Riverview for it to be considered a neighbour. In any case, to most people from the vast city of Toronto, New Brunswick likely seems small potatoes enough for everyone to be close to whatever happens to be going on there. And you know, there’s some truth to that. While I’ve never lived in Rogersville, I know someone who does. In fact, I know a monk. Now, it may seem a little like dropping names to boast that one knows a monk. Or perhaps, monks are only particularly interesting to me, and no one else will even blink an eye at what I consider to be my very good fortune. Regardless, the fact that I have visited Rogersville, met one of its resident monks, and drink my coffee in a mug made on the monastery’s pottery wheel, was enough of a connection for me. I felt the blazing plight of Rogersville as if I’d lived there. My small connection to Rogersville increased my sympathy for the village’s plight although I suspect I would have grieved a little anyway, given that I still feel like a New Brunswicker and am keenly interested in everything that’s going on in the province. Actually, I’m still passing myself off as a New Brunswicker, having not yet managed to jump through all the bureaucratic hoops Ontario requires when one asks permission to live in this swatch of Canada. I lived in New Brunswick for 20 years, so I suppose it’s natural that my sense of belonging won’t be easily severed. But I wonder if there is more than just time at work when one feels a strong connection to a place. I wonder if every place that’s been substantially home, whether for a long time or just briefly, ever loses its hold on us. I’ve lived in three of the four Atlantic provinces in my lifetime, and each has claimed a part of me as its own. I wonder, too, if we forge a sense of connection with a place when it offers us a graciously memorable experience. I think so, because that’s what happened for me in Rogersville. About a year ago, in mid-February, I led a group of 60 Maritime university students to Rogersville on a particularly special pilgrimage. I wanted them to meet Father Innocent, a monk who lives in the Cistercian Trappist Monastery of Our Lady of Calvary. In particular, I wanted Father Innocent to tell the students a little about his life, vocation and faith, using his passion and skill as a potter to shape his story. Rogersville has been home to the Trappist Monastery for more than a century. 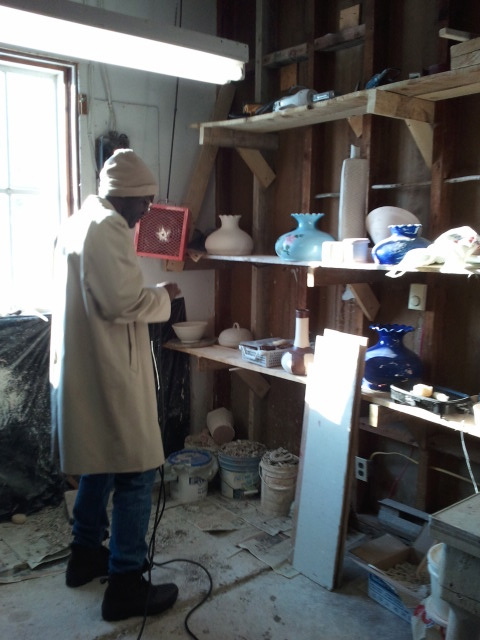 I’d often heard about it while living in New Brunswick, but had never actually visited it until last year when I was in search of a potter to participate in a spiritual retreat I was organizing for the university students. When I sent a polite email to the monastery asking if a visit to the their pottery studio might be possible, it was Father Innocent who replied, garnered permission from the Abbot (the chief monk) and who eventually welcomed our group on a clear, blue-sky winter day. Along the way to see the Trappists, we mistakenly knocked on the door of the nearby Notre Dame de l’Assomption Abbey, where an order of nuns keep their vocation. Needless to say, 60 unexpected university students threw the good ladies a little off balance. When we eventually reached the monastery, Father Innocent welcomed us warmly, gathered us into the chapel and shared his story of coming from Africa to New Brunswick to live among the small group of monks in Rogersville. 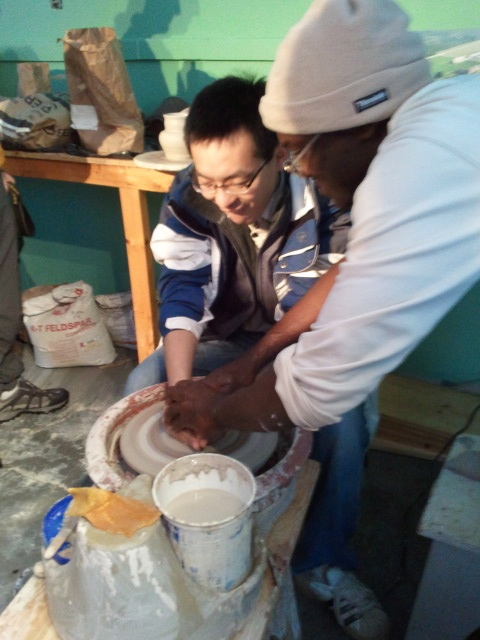 Then he led us down a lane and into his pottery studio where he moulded clay on a wheel and shared with us his understanding of why the Bible uses a metaphor of a potter and clay to explain something of the relationship between a creator God and humans. 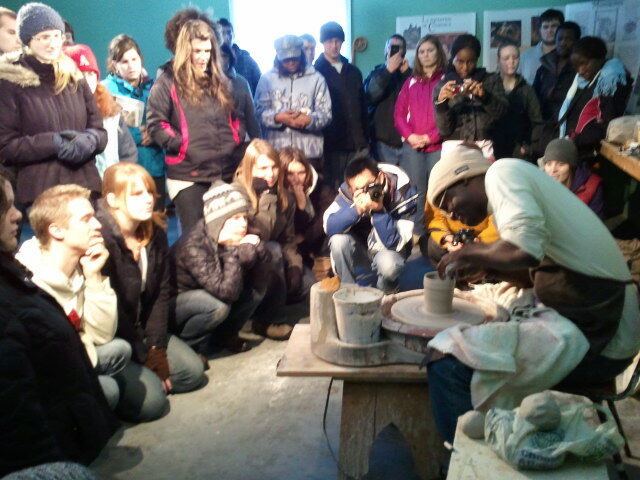 Father Innocent is passionate about the pottery he produces at his wheel. When he makes a beautiful creation, his eyes sparkle with pleasure. When he gives away a piece, he smiles generously. Learning to master the wheel. I left the monastery with a substantial clay mug crafted by Father Innocent at his Rogersville wheel. It has travelled all the way to Toronto with me, and now sits on a shelf in my new office. The mug reminds me of a place I’ve been, one that offered me a memorable experience, substantial enough to make me feel connected, even though I’ve never lived there, have never called it home. The news reports out of New Brunswick are hopeful this week. Lots of communities are helping Rogersville put its fire department back together. The village will rebuild its municipal and police offices.